Jamaicapage.com is a online magazine website that welcomes thousands of visitors to its pages each month and targets Jamaicans at home and abroad, students researching information about Jamaica, tourists who have or want to visit Jamaica and any internet surfer needing almost any Jamaica related information. Advertising your product, service or event on Jamaicapage.com is very cost effective and will do well to drive sales and build awareness of your brand. Most of our visitors are located in Jamaica, the United States, Canada, the United Kingdom and various Caribbean Islands. Please contact us if you would like to advertise on Jamaicapage.com. Jamaicapage.com offers banner advertising in 3 sizes, a 468×60 pixel banner at the top of all pages, a 300×250 pixel banner in the right column of all pages and a 120×600 pixel banner in the right sidebar of all pages. 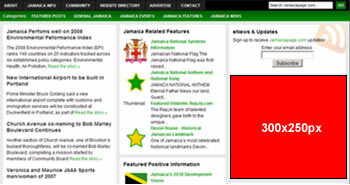 Placement of the 468×60 pixel banner on the Jamaicapage.com website. Above the fold and clearly viewable to all visitors. Placement of the 300×250 pixel banner on the Jamaicapage.com website. Above the fold and clearly viewable to all website visitors. This is the most visible and popular ad placement location of the Jamaicapage.com website. 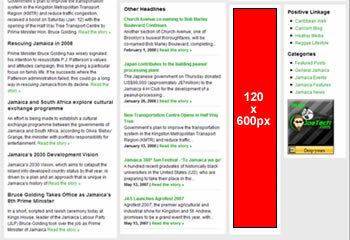 Placement of the 120×600 pixel banner on the Jamaicapage.com website. Below the fold but clearly viewable to all website visitors who scroll down while browsing through the website. Please contact us if you would like to advertise on Jamaicapage.com and need more detailed visitor statistics.